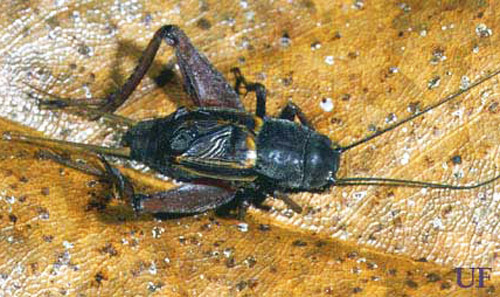 The southern wood cricket, Gryllus fultoni, is actually a field cricket even though it lives in the woods. However, a more precise nomenclature, say, 'southern woodland field cricket' would be too long and self-contradictory for a useful common name. This species occurs throughout southeastern US except in south peninsular Florida. Figure 1. U.S. Distribution of the southern wood cricket,Gryllus fultoni (Alexander). In the southern wood cricket, the color pattern of the forewings lacks the well defined longitudinal stripe of the southeastern field cricket and the well-defined light veins and crossveins of the sand field cricket. The forewings are not as short and usually not as dark as in the taciturn wood cricket. The stridulatory file has more widely spaced teeth than in the sand field cricket and the taciturn wood cricket. The ovipositor is less than 1.2 times the length of the hind femur. Long-winged individuals are not known from the field, but they occur occasionally in laboratory cultures. Figure 2. Adult male southern wood cricket, Gryllus fultoni (Alexander). Photograph by Paul M. Choate, University of Florida. Figure 3. Adult female southern wood cricket, Gryllus fultoni (Alexander). Photograph by Paul M. Choate, University of Florida. 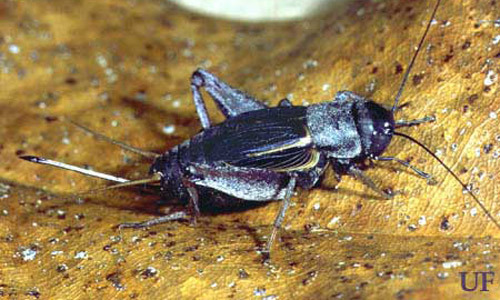 The southern wood cricket overwinters as a mid-sized juvenile and matures in spring. In Florida, some of the progeny of spring adults overwinter as juveniles and others mature in late summer and may produce additional overwintering juveniles. Farther north, this partial second generation is lacking. Found in upland pine, turkey oak, moist to dry broadleaf forest. The calling song (672 Kb wav file) is a series of fast-pulsed chirps, with a chirp rate of about two per second. Most chirps have three pulses, with the initial one being somewhat weaker than the rest (graphs). Doherty JA, Callos JD. 1991. Acoustic communication in the trilling field cricket, Gryllus rubens (Orthoptera: Gryllidae). Journal of Insect Behavior 4: 67-82. Nickle DA, Walker TJ. 1974. A morphological key to field crickets of southeastern United States (Orthoptera: Gryllidae: Gryllus). Florida Entomologist 57: 8-12. Walker TJ. (2014). Southern wood cricket, Gryllus fultoni (Alexander 1957). Singing Insects of North America. (11 April 2014). Publication Date: January 1999. Latest revision: May 2014. Reviewed: October 2017.